How can a home inspection help me as a listing agent? When listing a home do you ever dread what is going to be found at your listing's home inspection? Why not have the home inspected by your seller to help avoid any unwelcome surprises? No more renegotiations following a buyer's inspection. No more deals that fall through when the home inspector finds a serious problem. No more inflated cost estimates from the buyer's inspection report that will cost your seller money. 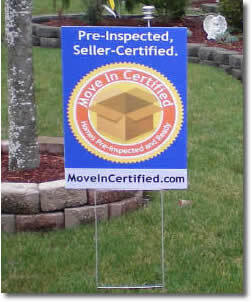 The reports hosted on www.FetchReport.com entice potential buyers to tour Move In Certified homes. No more will you spend countless hours and money advertising to get a contract that is nullified by surprise defects. It allows you and the seller to discuss what items should be fixed to properly market the home. It substantiates your price estimate, or it might convince a seller to rethink their asking price. It offers full disclosure protection to you and the seller. It allows your seller to shop around for the best repair prices should something be identified in the inspection report. We are just now beginning to discuss this exciting opportunity with a few agents in the San Diego area. Now is the time to get involved to be sure your listings stand out above all others. We serve the areas listed above as well as many others in San Diego. If you do not see your city, please contact us. We will be proud to serve your city.